Once upon a time in 1851 New York City, a certain Mr. Nicholas Pike purchased 100 Passer domesticus for the sum of $200 from England. Mr. Pike was from England as well, and was apparently lonely for the fauna of his homeland. The birds were released in Brooklyn, and have been spreading ever since. These sparrows, being tenacious little cretins, are one of the most successfully introduced species to North America. Their preference for human modified habitats (farms, suburbia, anyplace there are houses) has largely aided this success. They like what we like. I find the male plumage of this species to be quite handsome, but my praise ends there. Their agressive character that has aided their success, wreaks havoc on our native species of birds, especially blue bird populations. They will invade the nests of native species, peck the eggs or even kill and remove nestlings. I have been dwelling on this a bit lately as it is fall, and I have begun to fill my feeders again. To my delight I have 3 species of woodpeckers that visit the suet feeder, and a red-breasted nuthatch, chickadees, and an occasional Rose-breasted Grosbeak that come to the black oil sunflower seed feeder. To my dismay, all are overwhelmed by the hoards of House Sparrows that swarm the feeders. They gorge themselves until it seems they couldn't possibly fly away. I have switched the suet from a rennet and seed cake to a rennet and insect cake. House Sparrows like seeds, and will less likely ransack the insect cake. I stopped refilling the sunflower seed feeder for a few days, hoping the sparrows will eventually move on. In the meantime I worked up a watercolor of one as therapy. 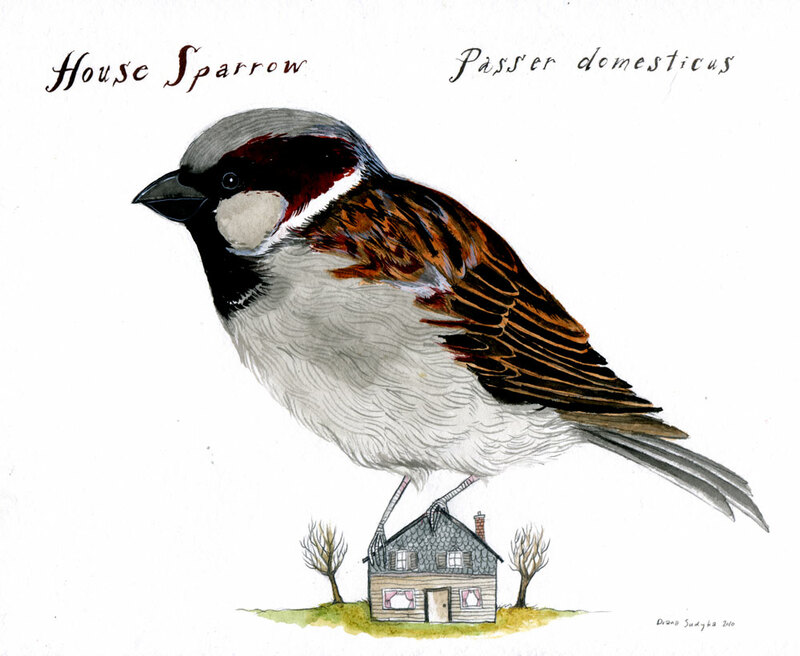 And if you want a fat Passer domesticus, it's in the STORE. I had no idea that the house sparrow was so insidious! I just like that they eat less birdseed than the doves. This is a very handsome specimen, and the way you've sized him is great (and ominous). And I'm glad to hear there is a scientific basis behind my general dislike of the sparrow. Between them and the occasional squirrel, I'd need to fill the feeder twice a day. I've found using suet in a cage helps cause only so many sparrows can cling to the cage at once. Luckily I've still gotten a good amount of woodpeckers, chickadees, nuthatches, cardinals and even a bluejay! is that a giant sparrow or a tiny house? either way, it's mighty purty. Amy - 'insidious' is indeed a good word for them! Ms. Pravina - Oh yes, I too could be filling the feeder everyday, with the way they and the squirrels cleared through it. Brink-It's a very, very fat sparrow, on a very thin house. In India, we're a little worried about the disappearance of the sparrow, especially from my home city of Bangalore. We (urban dwellers) generally consider them as fairly harmless cheerful birds that nest in the eaves of houses, but since there is a construction boom in many cities, such houses are giving way to apartment blocks. In Delhi however, we find sparrows in apartment blocks as well. Instead, the Rock Pigeon is the bird which causes a lot of frustration because of its nesting habits in balconies. Wonder if buildings could incorporate artificial nests in future for these determined birds. I'm having the same issue with my feeder - gangs of house sparrows crowding out all other birds. I even came home to a dead cardinal in the yard recently. Not exactly sure what happened but I think the sparrow had something to do with it. Also had a gang of grackles show up; it was like the Sharks and the Jets going at it. I've tried the suet, but they seem to enjoy it just as much. Hi Tixo - I have found that switching to a suet that doesn't contain any seeds (just rennet, or rennet and insects) has helped. For now, as least, the h. sparrows are showing no interest. I also have problems with grackles. They are the main reason why I don't put the feeders out in the summer anymore. Thugs, all of them! Ironically, the house sparrow is not doing at all well in Britain, where its numbers have declined spectacularly in recent years. Nobody is entirely sure why, but changes in farming practices (which reduce the sparrows' food supply) and modern home improvements (which reduce the number of suitable nest sites) are believed to be two of the main reasons. Hi Richard - That's really interesting. I have a friend that lives over there, and last year he mentioned the same thing. I thought: how can this be, when they are thriving here? But the the reduction of agricultural space, and home improvements makes a lot of sense.